I whiled away the evening yesterday browsing a new crafty site I found, The Crafty Crow. Really, it’s a roundup of other craft blogs, but it’s great because things are indexed by age level and theme. There are a ton of things I want to try! I’m always looking for fun things to do with big brother… 2 1/2 is a tough age, because he’s not quite old enough for a lot of things, and coloring with crayons every day gets a little old. 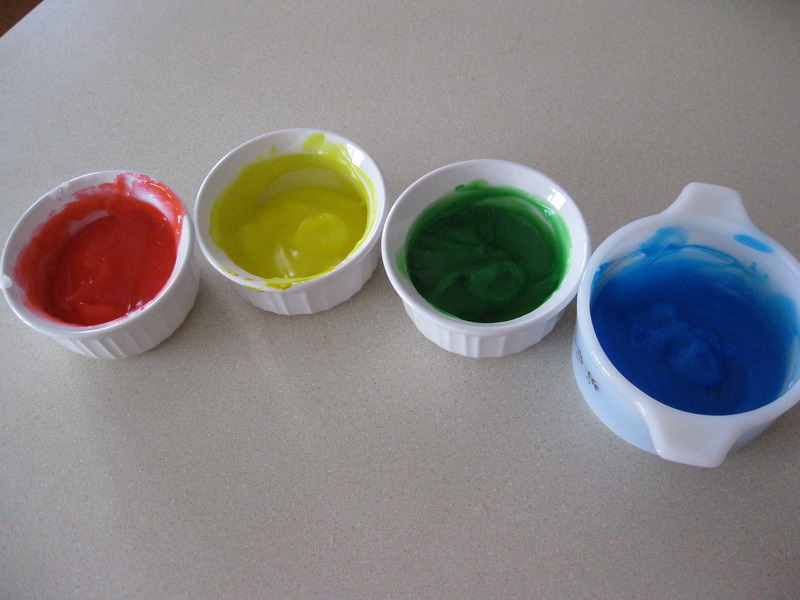 So, today I made these gel paints that were described on In A Nutshell. All it takes is cornstarch, water, and food coloring, which are things we always have around, and it was super quick, too! 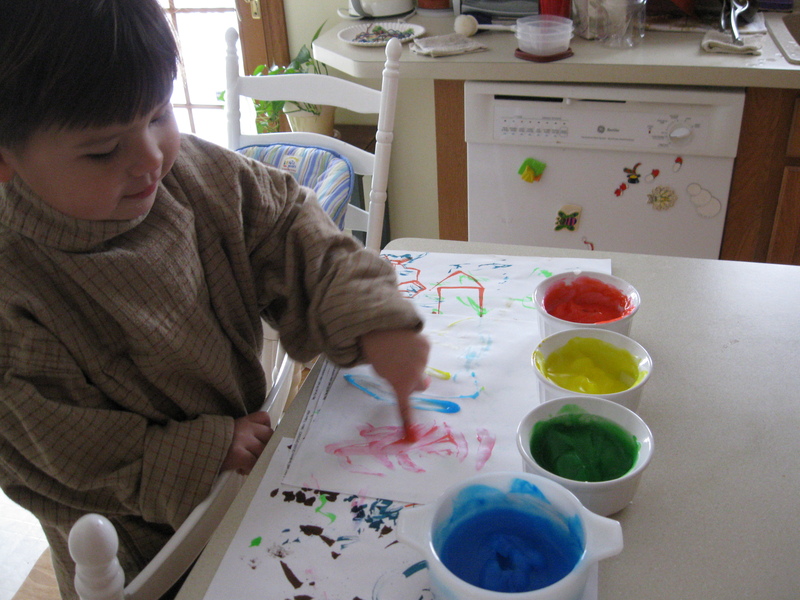 I think it’s safe to say that flannel shirts will not be coming back into vogue anytime soon, so I sacrificed an old shirt to be a smock, and we set to finger-painting. As advertised, these were a great way to teach color theory. We mixed colors to see what would result, and it was a lot of fun! * Next time, I would make less. We painted tons of sheets of paper (and paper plates) and had lots left over. * I would just do primary colors; the green went largely unused, and it’s kind of unnecessary. * I’d skip the scent. I like the idea, but I used mint extract in these, and I don’t want to give the kiddo the idea that it’s food, even though I guess it would be safe to eat. 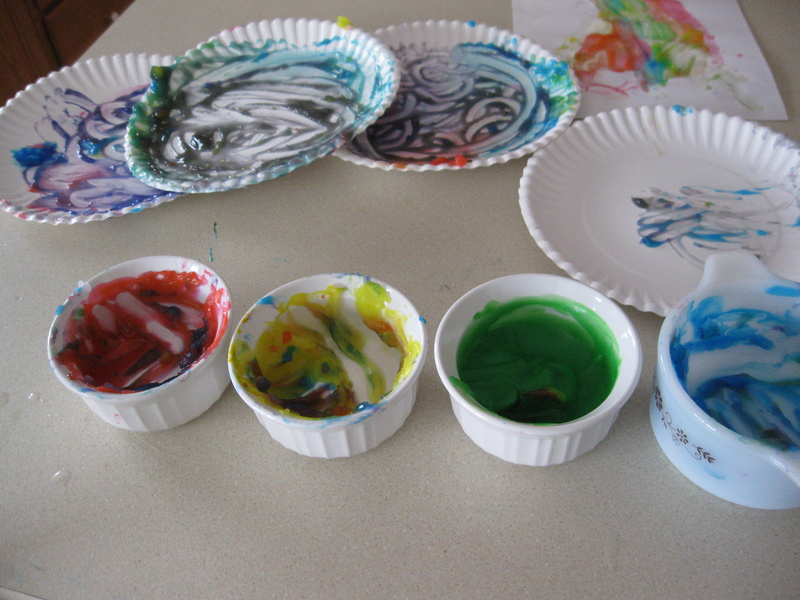 The Aftermath--our art, and what's left of the paints. Good times, though! We’ll do it again!